Korean-Americans haven’t been here much longer than a generation and a half. Still, we’re pretty much owning it, and it’s hard not to feel a little sheepish towards other minority groups who helped pave the way to a more colorful America. My grandfather brought my family here, with a mission in mind to spread Confucianism in America. His family followed, and a few years after, I was born in the States. You could say that Confucius said, “live in America”. And it isn’t really hard to imagine why my grandfather had such a notion in mind. We compare ourselves to the decadent empires of the past, hubristically self-assessing whether our global sway is facing an imminent collapse. During the 80’s, the United States addressed a similar period of declaring war against moral bankruptcy, albeit with a misguided and underhanded racial preference in criminalizing the African American population. The undoing of that era’s legislation, the ‘modern Jim Crow laws’, is just about to begin, finally, in 2019. What my grandfather believed was that America didn’t need more laws or lobbies, it needed a stronger philosophical grounding in its education policies. Not that America doesn’t already invest in the world’s best educational institutions throughout the major metropolises. But support for cutting-edge education pretty much ends there. Unfortunately, the success of my grandfather’s mission was limited to Korean American immigrants, my father among his students, who carried on in his stead upon my grandfather’s passing. Ever since I was young, learning of the order of Confucian philosophical tenets was a natural pastime in the household. The ‘Thousand-Word Classic’ or the ‘Four-Character-Small-Learning’, among other incredibly ‘oriental’ sounding poems were typical mealtime discussions — we’ve always enjoyed philosophical debate in the household, and what I learned was that the ways of logic were ancient, within both the Eastern and Western hemispheres. Aristotle during the day, Confucius at night; my mentors in morals were Classicists, in every way. Confucianism is more often associated with fortune cookies than any notable contribution to philosophy. The Analects are well-regarded among academic circles, but it’s fairly easy to say he’s not a household name in America. However, his cornerstone achievement may just be what America needs to reorganize its democratic spirit as a truly progressive nation. The Occidental has always viewed the Oriental as something else, a different world of thought. Well, the news flash is, the vice versa is also true. They really just don’t understand a lot of the Western customs or ways of thinkings over on the Eastern side of the world. Confucianism is really a practical social philosophy, and simply understanding the logic behind its tenets is a beneficial allegorical exercise in reviewing your political and social beliefs. Kings, pah. Well, there were kings in ancient China, and the monarchy was supplemented with a legislative oligarchy, a far more elegant solution to feudal rule than Europe had ever achieved. In such an environment where meritocracy of the ‘common class’ was both valued and rewarded, social order was easy to maintain for those loyal to the throne. This relationship may no longer be directly relevant to contemporary life, but it is a balanced perspective to which one can guide nationalism. It’s an apt metaphor. Replace the concept of a ‘king’ with a ‘nation’, and preserve a sense of loyalty. The pride, the spirit, and the sense of unity: both concepts define the ‘unifying element’ of a populace, and the reverence towards the concept exists as an idea of a greater whole — an organization of society into specialized roles, with a leader in the center. The leader sacrifices his life to guide his people to a better future, and the people all pay respect and follow the guidance to benefit the land and themselves. According to Confucius, the leader must deserve the respect of his people, of whom he owed the gift of having the responsibility of leadership in the first place. The people should honor and respect the leader’s guidance accordingly, as a flourishing society is for the greater good. In modern laymen terms, social equity in a capitalist free market. 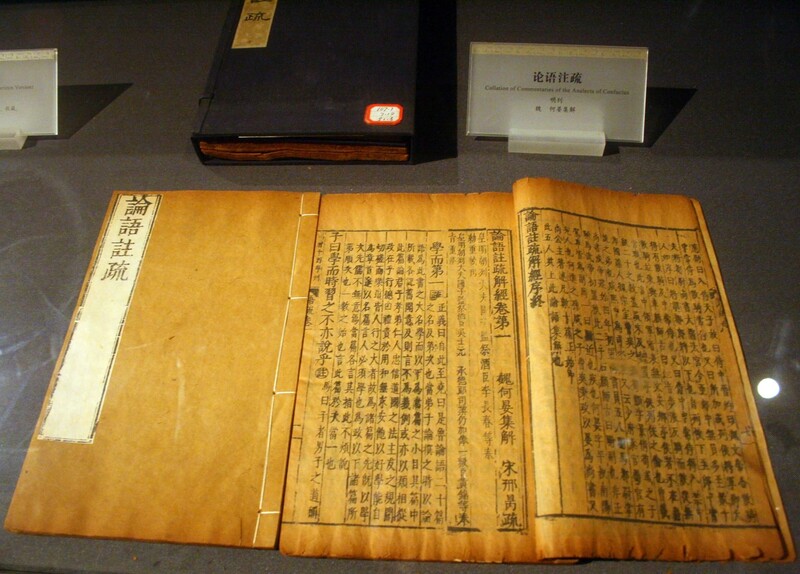 China practiced a variety of governing principles per province, and Confucianist states often similarly practiced legalism, which studied how to guide society through the effective communication and construction of laws. Laws are a ‘wish’, so to speak. We erect them in the hopes that they provide the moral and social boundaries of responsible citizenship. Every law-abiding citizen strengthens a lawful nation that is practiced in justice and democracy. Is this China or America? The source may simply differ, but Athens and the Confucian school of governance are almost identical for similarly advanced civilizations. No trade existed between the hemispheres during that era of history, so it can only be logically concluded that it was the most efficient solution to royal governance at the time. American pride is something that everyone living here keenly feels. Forget what the current administration spews about immigrants endangering American lives. Some minor numbers may be mentally imbalanced or of malicious intent; most immigrants and refugees are simply seeking better lives. People who want better lives don’t step out of line. And they shouldn’t have to fear for their status when they are desperately contributing to our economy, just to ensure their homes. Governments exist to protect American homes, not to decide which homes are American. Americans owe loyalty to our nation, including the government, and especially the military forces that protect us from physical harm. Correspondingly, it therefore falls to the citizens to keep the nation healthy on the inside too. A responsibility we owe to the land that nourishes our individual dreams. We have no kings here because we’re all kings of our own lives. Even if that life isn’t quite as you imagined it, you get to choose: McDonalds or Burger King. There’s always at least a choice, that’s the American Dream. And while that seems a bit cynical, it’s better than what most of the world has got. This relationship of the ‘king to subject’ isn’t unlike John Locke’s Enlightenment principles on governance in a democratic society. The primary reason is because both relationships are described as mutually beneficial existences, rather than a unilateral, utilitarian pyramid rule. Western feudalism has its serious horror stories of tyrants and evil monarchs, and so too does the Eastern hemisphere, but there is no real pursuit of social organization of a benevolent monarchy in codified form in European history. Instead, religious organization became the moral compass of the ‘Old World’. So, it’s not a surprise that Confucian influences still exist in the social order of Eastern countries, and that very culture is brought to American shores through cross-culturally educated citizens such as myself. Who’s my ‘king’? I’d like to think that it’s the future we hand to the next generation, which would be the children of the world. A radically progressive idea, but a peaceful one. Perhaps, it’s a possibility, if we consider merging the Classical philosophies of governance of both East and West. The perfected socialist, capitalist democracy. Who doesn’t love a good ‘father-son’ story? A game of catch in a sunny backyard, help with that darn math homework, and a ‘quiet’ evening of watching football. Beers, bats, and boatloads of competitive ego ruining everything into a comically amazing set of drinking stories for future dates and buddies. Confucius said, “good, drink your beer.” No, he didn’t. But he did respect that fathers play a special role in the education of their sons. We can just simply extend the relationship to all children in a contemporary interpretation, and what he’s explaining is simply that good parenting is fundamental to raising a healthy child. Who would’ve thought. A parent guides the child, and so the child demonstrates respect to the parent, in devoting oneself to the betterment of the family’s name and the family’s well-being. In a sense, the concept of ‘filial piety’ is incredibly selfless. So selfless, in fact, that in reality, it sounds almost stupid to believe that it works. Famous Confucian allegories tell tales of a child that allows himself to be bit by mosquitos to spare his earnest parents from suffering, every night. Not only is the story terrifying in its symbology, it is obviously disgusting and cruel. Even for ancient standards. Although nobody suffers like that today (whew), the typical schisms of the Oedipal complex (father-son ego competitions) express themself in all nuclear relationships. The parent guides as the superior to the child, to be outperformed by the child, eventually, who then experiences the same edge of the ‘sword of youth’. It’s the cycle of life, and every wise soul has noticed the pain and beauty of it. Respecting the heritage that our parents gift us extends to taking care of our health for the sake of longevity, carrying on the family name, and being happy. If this sounds unusual or different than what you experience in your family, then perhaps you should reach out to your family more often, or consider how your family maintains its relationship. It’s not to be pedantic, but rather for the sake of a healthy reflection on your nuclear family relationships. The basis of the Confucian definition of how a father-son relationship exists is through the connection of biological birth. As such, there is no escaping the burden of the ultimate bond one trusts in life, and many without a father or a parent are defined by the absence of such a presence. Therefore, it behooves the younger generation to make it the best we can — we have only benefited, even if only in understanding a global issue like climate change. Every generation faces its differences of perspectives, but the mission is always the same — providing the next generation the means to ‘carry the torch’, to further the human race beyond its current status quo. Sometimes family members need to be selfish, and others need to carry some of such burdens. Other times, there’s plenty to share than everybody needs, and those times are always good. How to remain happy at home throughout both such periods in life, and every period in between is more about the mutual respect and devotion that family relationships require. The marital bond is always caricatured in every culture. The ‘ol’ ball-and-chain’ is popular aphorism in America, denoting a loving but derogatory term to the wife that keeps her husband in line. In the East, the nagging wife is a typical archetype as well, but so is the subservient housewife, as well as the domineering matriarch. Asia is a diverse place, just like the West, and in China, Korea, and other trade-intensive nations, powerful women have swayed the tides of Eastern history. That being said, Confucius preached a mutual respect between the husband and wife, and yet the husband would own the land, make the decisions, and deal with governing the household. The wife would obey and prepare food. Honestly, I would say the wife is getting the worse deal. Preparing food for feudal households is literally sweatshop slave labor, as the recipes are labor and finesse-intensive (and delicious), and deciding what to represent the name of a noble household is honestly not that difficult a task. It holds a lot of social pressure, but most household names were connected to governing minor provinces of land, and the heirs had often not much to do than collect taxes: mildly disliked or unknown nobles, just like those in the vast feudal networks of Europe. Everyone that has siblings can tell from the title that this is the relationship that nobody really knows how to deal with. Neither did Confucius. He basically explained that the older brother ‘rules’. And there’s quite a lot of guidance on how that comes to pass. Basically age and experience triumphs over simple reason and knowledge. That makes sense, but the unilateral expression of brotherhood in Confucian terms seems a bit outmoded, to be honest (I’m the younger brother). The older brother is the guiding principle, the younger brother, the supporting principle. A partnership where the commensurate balance is shifted to the benefit of age. But if you are noticing a pattern, it’s because the relationships are structured in power/respect hierarchies, where age is often the deciding factor. Between brothers there is not much to be said or to be resolved in the relationship — competition and play can be difficult, but it is an essential part of the relationship that teaches social cooperation. More importantly, the relationship focuses on maintaining mutual respect nonetheless, and emphasizes on sharing good fortune, rather than competing for it. From the King to the Older brother, and from the Subject to the Younger brother, the first four relationships of the five represent how to maintain order properly through relationships where there exists an imbalance of power. That imbalance itself resolves into a balanced society, because the realistic perspective is that not everyone is equal. Some people have more, and other people have less. Who deserves your respect? Who gives you respect? Why should this matter? Somehow, it does, no matter where you come from. Respecting those under your employ, or those who are expected to follow your orders is the fundamental quality to deserving your followers’ respect. In short, it’s the ‘Golden Rule’, interpreted in four categories of social obligations. Truly, not so different than the Enlightenment principles that this country was founded on. The fifth relationship is different from the rest, in that it represents a truly mutual relationship. Mutual respect and kinship, not fettered by the obligations of family and to the nation. It remains the one vital relationship where one can express oneself freely. And that has remained true everywhere, throughout all time. My grandfather wasn’t so naive to believe that his teachings could morally transform America. But he was wise enough to plant the seeds of his philosophy. I don’t write this out of any sort of grieving memoriam, but rather out of admiration of what he sought to accomplish. What my father had since sought to grow. What I might be able to contribute. It’s a particular heritage of rational discipline that defines a large part of Eastern social structures. It explains, surprisingly, much of the humor and the drama of popular cultural exports such as manga and Korean dramas. More importantly, it also gives guidance towards the proper demonstration of respect towards one’s elders. And while America has always been the land of the ‘rebel without a cause’ and the ‘entrepreneur’, during times of recovery, a balanced perspective is always a healthy notion to consider. Confucianism isn’t about teaching yourself wisdom or living life wisely. It’s about respecting the relationships that define who we are. Where we live is a relationship that defines a foundation of our core beliefs. We owe that heritage our respect. Who our parents are define our core psychology. Our moral goodness is a gift and the sacrifice of good parenting. We owe that sacrifice our respect by passing it forward. How we treat our lessers and our betters defines our sense of ego and respect for others. The ‘Five Relationships’ organize the proper dose of ego and pride in the appropriate situation. A guide for social propriety and elegance — an acknowledgement that not everyone is equal, but that everyone can give and be deserving of respect. To me, it’s a beautiful wish, and one that America used to practice with greater fervor in the past. Maybe it’s anachronistic or antiquated, but the ‘good times’ vibe of a Rockwellian America just might be an adept parallel to how Confucianism can bring order to a society. In the end, you are the sum of your experiences, and your experiences are the sum of the people you know. From your nuclear family, to your friends and neighbors, and to your country, you owe your respect. It is the same meaning as learning to respect yourself, as these are the ideas that define you. Respecting social order brings oneself the peace of ‘self-awareness’. A social sum of like-minded people who care to respect one another builds a trust within a society, which enables productivity, collaboration, and creativity. A healthy nuclear family, a healthy neighborhood, a healthy nation — a sum of American values during the ’80s, ironically juxtaposed with ‘greed is good’. But a healthy society is the goal of a Confucianist society, and the reason is simple: to ensure the pursuit of happiness for all citizens in a collective manner. In many ways, I carry on studying my grandfather’s and father’s teachings because I believe that there is merit to the parallels between contemporary critical theory, political science, and ancient Eastern wisdom (har har). The East and West have a lot in common, but not as much in common cultural tastes (the difference is that snails are ‘cooked’ differently). In the end, everyone is looking for some kind of sustenance or fulfillment, and finding it is always a personal journey. Everyone’s personal journeys are filled with intersections. Intersections of culture, of the East and West, everyday, everywhere, and it’s time we begin to earnestly communicate to one another just how similar we are. Isn’t it about time that globalization begins to precede nationalism for economic productivity? It’s in everyone’s interests; for the greater good.